This product is no longer available and has been replaced by: SP5. Beginning 1 November 2007, the SP1.6 was removed from our pricing system. 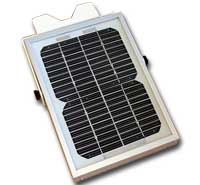 The SP1.6 was a 1.6 Watt solar panel that captured solar energy via a 24 square inch surface area. This small solar panel was only suitable for CR200-series dataloggers at locations that had good exposure to sunlight. The SP1.6 had a 3-foot cable that was fitted with a special connector for insertion into a mating power connector on the ENC200. A similar solar panel, the SP1.6-L, was offered that connected to the terminal strip of a CR200-series datalogger, or to a standard power supply. The SP1.6 was a 1.6 Watt solar panel that captured solar energy via a 24 square inch surface area. This small solar panel was only suitable for CR200-series dataloggers at locations that had good exposure to sunlight. The SP1.6 had a 3-foot cable that was fitted with a special connector for insertion into a mating power connector on the ENC200. A similar solar panel, the SP1.6-L, was offered that connected to the terminal strip of a CR200-series datalogger, or to a standard power supply. The SP1.6 was reitred on 1 November 2007.